These bite size rolls are so easy to make and are perfect for entertaining. They look great, and taste delicious. 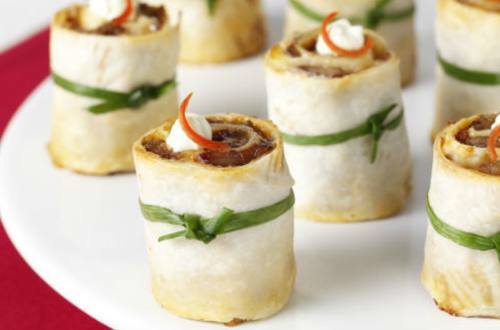 Simple finger food that is sure to impress. 1 Prepare Chilli Con Carne according to directions on pack, using ingredients listed above. Cover and simmer for 15 minutes, stirring occasionally. 2 Remove cover and continue to simmer for a further 5 minutes or until beef is cooked and sauce has thickened. Allow mixture to cool before using. 3 Spread ¼ cup of the Chilli Con Carne mixture over two thirds of a tortilla, sprinkle with ¼ cup of the cheese. 4 Starting from the edge nearest filling, roll up tightly. Use four toothpicks, spaced evenly, to secure the end of the roll. Repeat with remaining tortillas, Chilli Con Carne mixture and cheese. 5 Using a serrated knife, trim ends of tortilla rolls and slice into four pieces. 6 Place cut side up onto a baking paper lined oven tray, spray lightly with oil and bake at 200°C for 6-8 minutes, or until rolls are lightly browned and cheese is melted. Serve topped with sour cream and chilli.